Archbishop Jorge Bergoglio was elected to Saint Peter's Throne in one of the briefest conclaves in history. Just months into his papacy, Pope Francis has already set a new tone for the Church and its 1.2 billion followers. For many he has rekindled a sense of hope, for others his break from tradition is troubling. Who is this new Catholic leader? And most importantly, how will he change the Church? 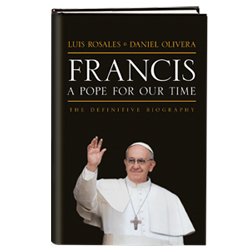 Francis: A Pope for Our Time, The Definitive Biography incisively chronicles Pope Francis' ancestry, youth, call to faith, humble beginnings with the Society of Jesus, and rise through Argentina's ecclesiastical ranks, all the way to the Vatican. This is the first major biography written by journalists from Argentina who have tracked the Pope's public life for decades. The book emphasizes His Holiness' Jesuit background of humility, poverty, and service that stands to reform the Vatican's long history of lavish excess. The book illustrates Pope Francis' pastoral commitment to society's most underprivileged and disenfranchised. Will the Pope offer a new approach on the Church's teachings on abortion, contraception, gay marriage, women clergy and other issues? This book reveals the man behind the curtain. This new biography also details Jorge Bergoglio's coming of age during the Peronist years and the challenges he faced throughout Argentina's brutal military dictatorship, as well as his political stance against the Kirchners.